This up-to-date reference is the most complete dictionary covering this fast-paced field. 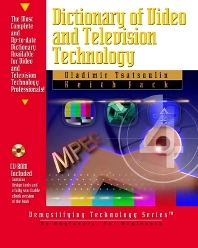 It contains virtually all the terminology commonly used in modern global video and television technology, with thorough definitions aimed at the engineering level. It covers all international video standards, digital and analog video signals, data compression, video conferencing, encoding/decoding--indeed, every term associated with video/television technology. Compiled by two internationally recognized video/television experts, this dictionary promises to become a standard reference. Contains thousands of terms and their definitions in alphabetical order. Keith Jack is Director of Product Marketing at Sigma Designs. Sigma Designs develops and markets high-performance, highly-integrated System-on-a-Chip (SoC) semiconductors for IPTV Set-top Boxes, Blu-ray and HD DVD Players/Recorders, HDTVs, Digital Media Adapters, and Portable Media Players. Prior to joining Sigma Designs, Mr. Jack held various marketing and chip design positions at Harris Semiconductor, Brooktree, and Rockwell International. He has been involved in over 40 multimedia chips for the consumer market.